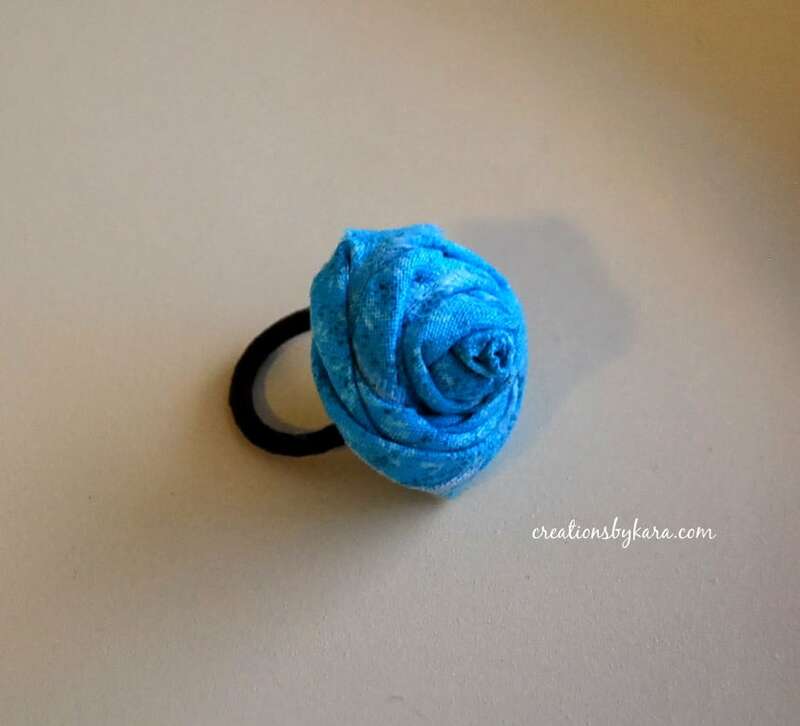 Fabric Flower Rings are so easy to whip up, and they make perfect girl’s camp crafts. Or make up a bunch and give them as gifts! Today I’m sharing yet another handmade Christmas gift idea. Girls of all ages will love these cute and unique flower rings. I saw something similar at a local quilting store, and just had to give it a try. 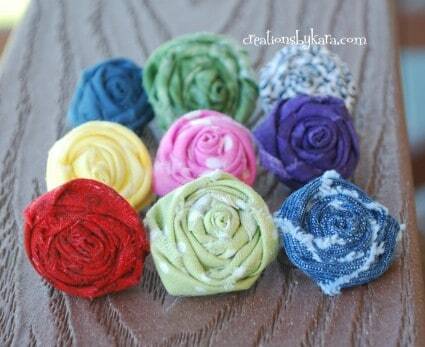 You can use any color or type of fabric you like. The one on the bottom right was made from an old pair of jeans! 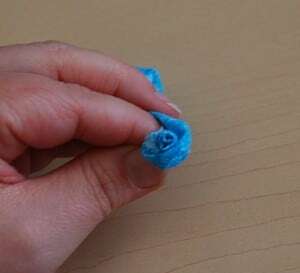 Take your strip of fabric. 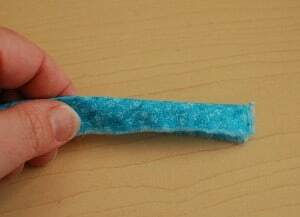 I tore mine so it would have a nice shabby edge. Pull off any loose threads and lay it out on your work surface. 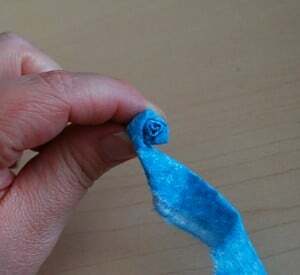 Fold one end in half, wrong sides together. Fold the end in diagonally, and hot glue it in place. Next start rolling the fabric up, from right to left. 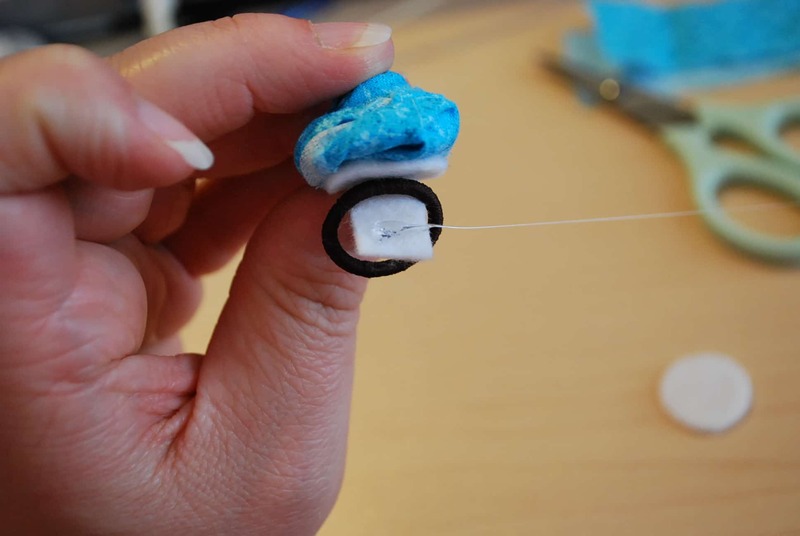 Use tiny dabs of hot glue to secure it in place. 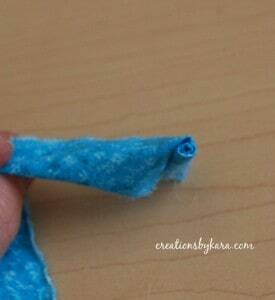 When it is the size you want, cut the fabric, leaving a small piece to attach to the back. On the back side, you should have a roll of fabric sticking up. Cut it off. 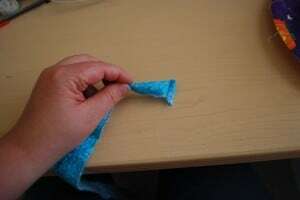 Then fold the end of the fabric to the back and attach it with hot glue. 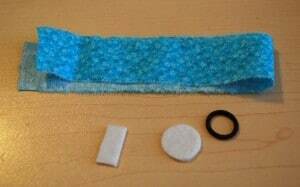 Now take your elastic and put it in the middle of the circle with the little strip on top of it. 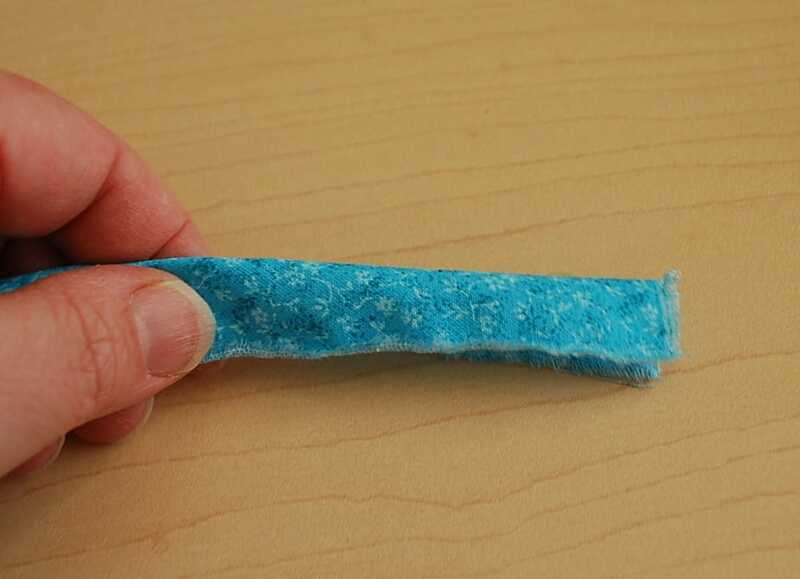 Basically you are going to sandwich the elastic between the two pieces of felt. Attach the strip on both sides with a small amount of hot glue. It will look like this when you are finished. Aren’t they pretty? 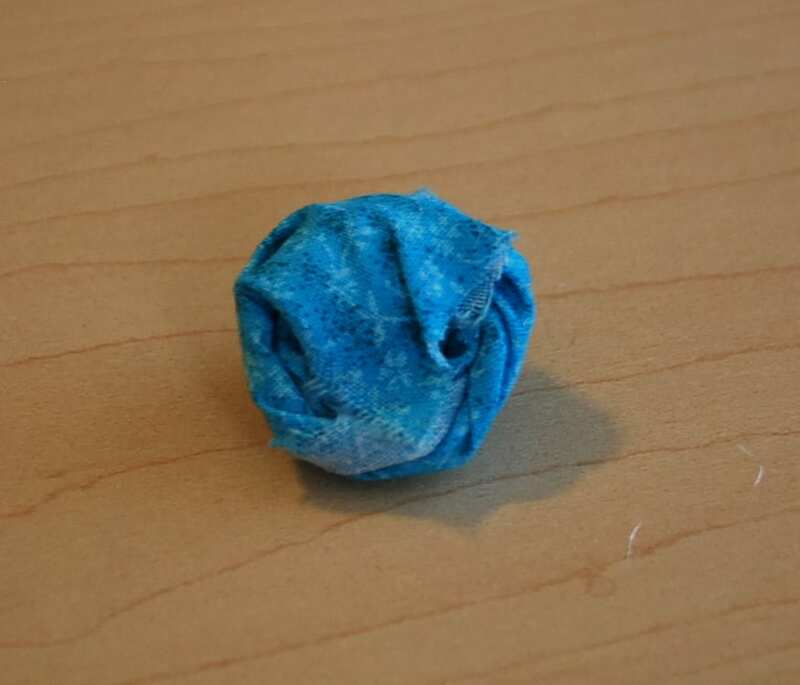 Now go make some for your friends! 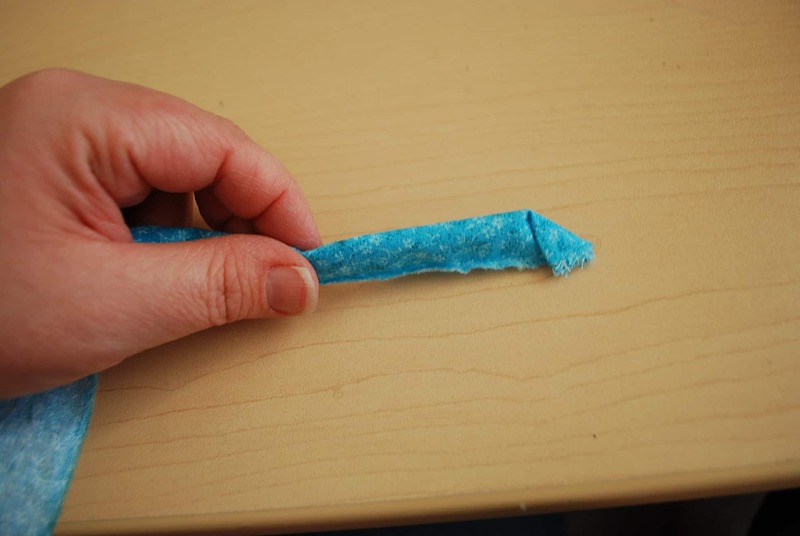 I got lost in the felt tip step…..would someone explain how to place the felt tip? Pleaaaaaaaase!!!!!!! I love these to use on curtains. I am planning to make them a little looser, and from light fabric to that they can be placed in the different parts of the curtain (made of white light, almost seemless fabric). I’m not quite sure what you mean about a felt tip. 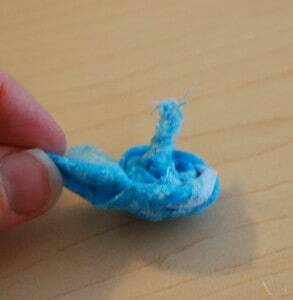 If you aren’t using them for rings, you just glue a circle of felt to the back, and you’re done! This is so cool! 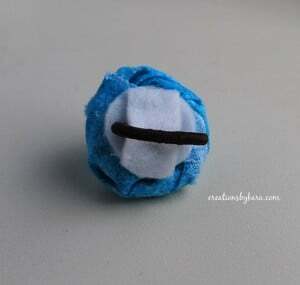 But I think I’m going to attach the hair elastic part to a keychain, it will look awesome! What I really like about your tutorial is that you can use materials from around the house and won’t have to rush to the craft store to buy it. 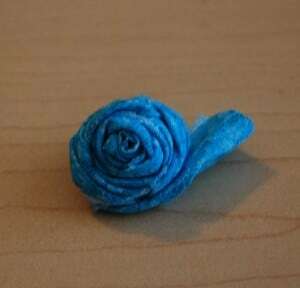 Cant wait to make more! just saw this on craftgawker… great directions and I can’t wait to make some of these!!! I have been eyeing these and wasn’t sure how to make them! Thanks so much for the east to follow tutorial…I have added these to my very, ever increasing, to do list! Hi Kara! Im Kara! You newest follower!!! I cant remember how i found you but SO GLAD i did! 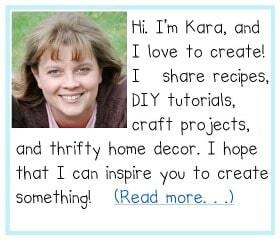 I LOOOOOOOOOOOOVE your blog! I will be roamin around in here for a long while! I have a Brother & sis in law that adopted…What a Blessing you will be to a child 🙂 I would BEYOND ADORE it if you would visit my blog and 14 days of xmas trees… I have a giveaway you might like too! Glad God led me to you!